In the early 2000s, as location-aware devices first became commonplace, there was a lot of hype surrounding their potential creative use by artists. However, over time, this initial enthusiasm for "locative media"--projects that respond to data or communications technologies that refer to particular sites--leveled off, even dissipated. Regardless of this drought, geospatial technologies are widely used, and play an important and often unnoticed role in conditioning many aspects of our existence. Responding to this condition of ubiquity, artists have continued to use locative technology critically, opening up closed systems, making its effects visible, and reconfiguring our relationship with it. Several recent projects have aimed to open up closed systems such as GPS (Global Positioning System). and space satellites to users' participation. One example is the Open Positioning System (OPS) by German artist Philipp Ronnenberg, an alternative positioning system that works by triangulating seismic frequencies produced by generators in power plants, water turbines, pumping stations, or large machines in factories. If the sensor, held in contact with a wall or the ground, can detect seismic frequencies from three known sources, its location can be established. (A similar proposal was made by the British police, who are using sound frequencies from the background noises on incoming emergency calls to help fight crime in the UK). Philipp Ronnenberg, Open Positioning System (2012). Maps are power and those who draw them provide access to the world. 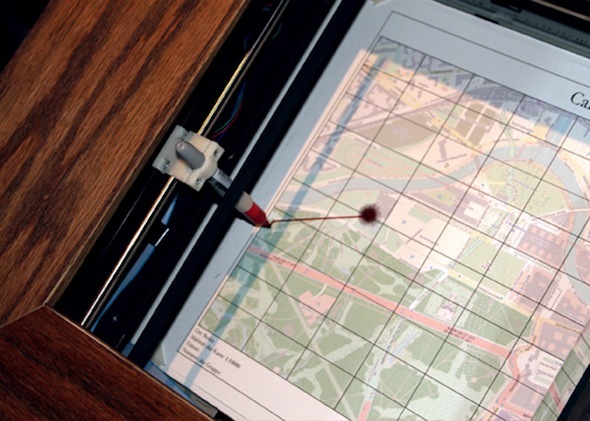 Maps and navigation instruments shape our perception of our world. The devices and technologies we use are showing us where to look at and where not to look at. As the technology we are using today, GPS, is controlled by governmental / military institutions we as users do not have an insight if the system will be shut down one day. Nor do we have a clue how and if the system will be changed in accessibility. We totally rely on a service which could be edited at any point. As people push for more transparency and openness in technology, why shall we not think about open infrastructures as well? In times of surveillance and uncertainty, people should start to develop their own infrastructures which they can trust and which they can maintain themselves. In response to these conditions, OPS is an attempt to curtail the US government's control of geolocation systems, opening them up for average citizens to get involved in information gathering. 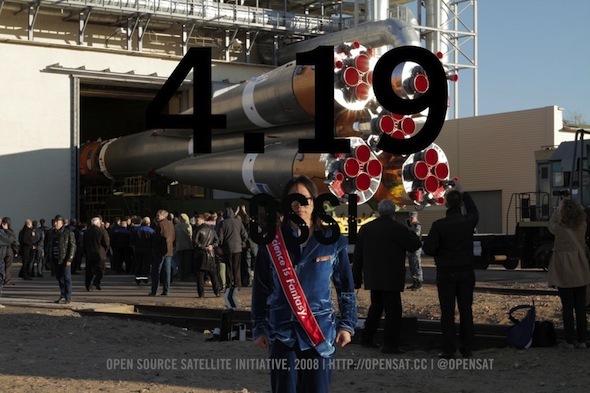 Taking a similar strategy of opening closed systems is the Open Source Satellite Initiative (OSSI) by South Korean artist and maker Hojun Song. Song designed a satellite that anyone can make; he offers the plans and instructions for building it and launching it into orbit. 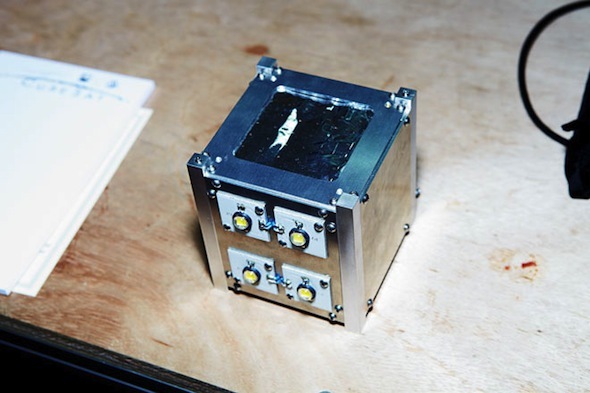 The device itself is about 60 cubic inches, costs under $500 USD, and consists of a solar cell, lithium-ion battery, modified Arduino controller to withstand the Sun's radiation, and four LED lights that are bright enough to be viewed from Earth once the object reaches orbit. The most challenging aspect of the project was to get get the little device into space, forcing Song to run a crowdsourcing funding campaign and pay close to $100,000 to the commercial rocket corporation NovaNano for this service. Song's satellite senses cosmic microwave background emissions in order to help prove the existence of the Big Bang and to seed a random number generator and transmit that number to Earth. The numbers created by the satellite are then used to play an actual lottery game and to generate particle-like computer graphics simulations. Hojun Song at launch for Open Source Stellite Initiative in Baikonur, Kazakstan. OSSI Prototype: GOD (Global Orbiting Device), 2010, Photo: Motohiko. Song's approach is close to that of the AMSAT or Radio Amateur Satellite Corporation, an organization founded in 1969 that attempted to bring space research and study into the public domain. The device is open source and all of his code and hardware schematics for the Satellite were released free to the public through on the popular site, GitHub. The viewer on Earth can communicate to the satellite through a wearable device that is worn over the shoulder; it requires two people to hold hands with the wearer to enable the conductive sensor and send a message to the satellite to blink its lights on and off. Song calls this type of interaction "communication that needs a collaboration or a collaborative fantasy." Even as the US has decommissioned its government-funded space shuttles and opened up space exploration to international corporations such as Virgin Galactic, SpaceX, Blue Origin, PlanetSpace, and hundreds more, the potential social reach of these companies is still eclipsed by the amount of money needed to send their vessels into space and maintain the lives of their passengers. Whether they are going on a short "tourism" flight or a longer mission excursion, the cost is still beyond that of what an average citizen on most countries can afford. OSSI's use of satellite-generated data for terrestrial gambling is a wry comment on the fact that space exploration, once the purview of government agencies, is now available to wealthy individuals. 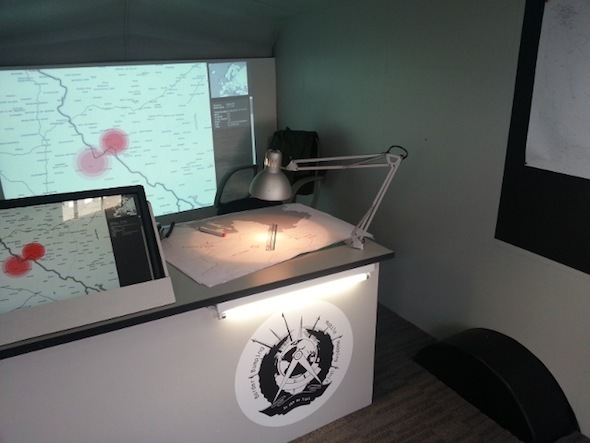 Other locative media projects employ data visualization strategies to stretch and critique location-based information. Border Bumping (2012) by Julian Oliver, described cautiously by the artist as a work of "dislocative media," is a smartphone application that collects cell tower and location data of individuals in close proximity to national borders. Oliver explains, "For instance: a user is in Germany but her device reports she is in France. The Border Bumping server will take this report literally and the French border is redrawn accordingly. The ongoing collection and rendering of these disparities results in an ever evolving record of infra-structurally antagonized territory, a tele-cartography." The project uses collected data against itself, pointing to ambiguities that persist in a highly rational system, and against the state, suggesting a blurring of political boundaries through connectivity. Julian Oliver, Border Bumping, (2012). A more open-ended response to location-based data can be seen in Quotidian Record (2012) by US-based artist Brian House. Quotidian Record consists of a limited edition vinyl record etched from a recording of House's location data over an entire year. Every locality, city, country and continent that House traveled to over this period were recorded with GPS coordinates on his mobile phone and then automatically assigned a musical note. The resulting long playing (LP) record is a physical artifact of location-based information where each rotation of the vinyl represents a 24 hour period of House's life. 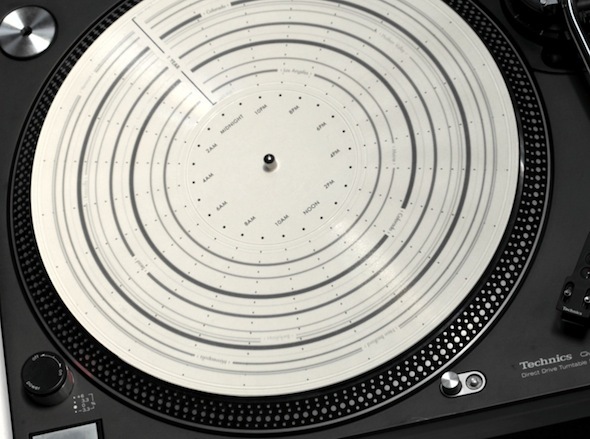 With 365 rotations on the record, an entire year progresses over an 11-minute time frame. The record itself carries markings that represent the time the data was captured and the names of the cities House traveled to over the year. As House explains, "It provides an expressive, embodied, and even nostalgic alternative to the narratives of classification and control typical of state and corporate data infrastructure." Although House's data was gathered by government controlled satellites, his intention was to remix and reimagine the type of output that these machines could designate, choosing a form (the LP) that offers an intuitive and tactile experience rather than an analytical one. Brian House, QUOTIDIAN RECORD (2012). Where House and Oliver are concerned with critiquing the collection and representation of location-based data, other artists take on the ways in which location-based images increasingly condition our experience of the world. One example, which adopts the strategy of restaging historical works through new technology, is iSkyTV by the Institute for Infinitely Small Things with Sophia Brueckner. This project is based on Yoko Ono's Sky TV (1966), cited as one of the earliest examples of video sculpture, in which the artist placed a Sony Portapak video camera on the roof of a gallery, pointed it at the sky and clouds, and sent the feed via a cable to a television placed inside the gallery. 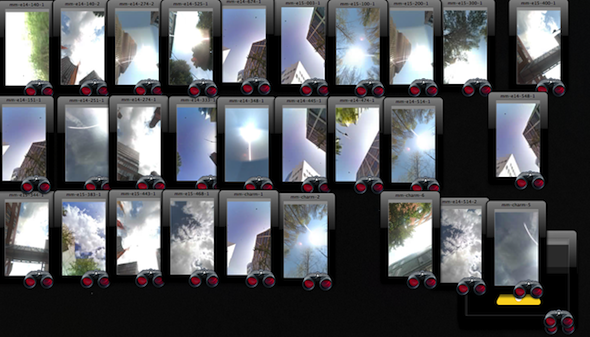 Thus, live images of the sky were viewable in the interior space of the gallery, bringing the outside world to the inside space in real time through live video. iSkyTV (2013), in contrast, features several monitors displaying images of the spaces surrounding the gallery taken from Google's Street View service, foregrounding the fact that such technologies act as the lens through which we see our thoroughly scanned and digitized planet today. Institute for Infinitely Small Things with Sophia Brueckner, iSkyTV (2012). #82.948842, Detroit, MI (2009), Doug Rickard, 2010. 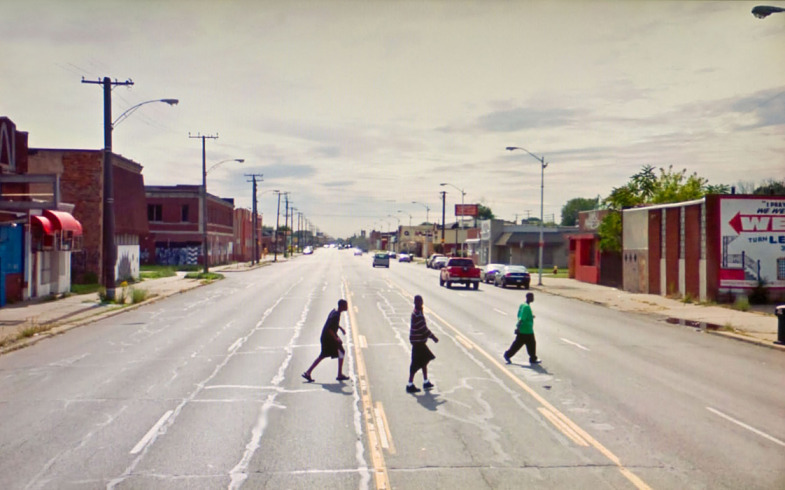 Also calling attention to the reframing of the world through locative media is Doug Rickard's Street View. For this project, Rickard collects images from the same archive used in iSky TV, Google Street View, but rather than showing us nearby spaces, he is particularly interested in places to which the viewer probably never ventures--locations with poor infrastructure and low economic value . His work re-appropriates images taken from these areas by Google's Street View camera. Rickard is particularly interested in how Google's camera is positioned when it shoots its generic images of the world's streets. High above, the vantage point of the camera reinforces the hierarchy between photographer/viewer and subject, looking down on the poor or derelict streets of urban centers in economic decline such as Detroit or New Orleans. Like other locative media projects, Rickard's work re-appropriates a widely used technology and interprets it from a reverse angle of desolation, isolation, and surveillance, calling attention to the ways in which it reproduces imbalances of power. Other projects take on the photographic act itself and its reconfiguration through location-aware technology. Buttons (2009) by German artist Sascha Pohflepp originally began as a modified cellphone and later developed into an iPhone app in order to incorporate location-based data. Buttons is a camera without a physical lens, but only a shutter button. When the button is pressed, the exact time of the press is recorded as well as the location of the camera. This information is then searched on the internet, returning a photo with either the exact location metadata or the exact time stamp of creation. Thus, Buttons is a camera that allows you to take someone else's photos. Another response to the sense of local displacement associated with networked image-making is seen in a project by British artist Mark Selby, Camera Explora. The project employs a specially designed location-aware camera with an embedded map to urge us to explore a wider range of locations and photograph each more mindfully. The camera only allows the user to take one photo for each plotted grid on the map, and when this picture is captured, the camera disables itself until the photographer physically moves to a new area. The photographer's movements around the city are also plotted in real-time on a map, and each photo is printed as it is taken. Selby states that "these constraints aim to encourage more attentive exploration of the city, more careful consideration of which locations or experiences to record, and consequently, in combination with the materials produced, to allow the creation of more valuable records of experiences." In effect, Selby's redesigned camera paradoxically enables self-expression by limiting it based on a user's location and movement. One is given incentive to venture to new, unexplored areas; one also has to consciously decide and hierarchically categorize what the most important characteristic of a specific location might be before they snap a photograph;. To a certain extent, this approach brings us back to the days of traditional film photography, where we only had a limited number of photos per roll of film and had to be more selective about what was photographed. Selby's project asks us to pay closer attention to the photos we are snapping and the spaces in which we snap them. Camera Explora Plotter, Mark Selby, 2012. In addition to critiquing the ways in which locative media alter our experience of urban space, artists are also reflecting on the ways in which the city itself changes in response to tracking apps and satellite maps. For example, New York based artist Molly Dilworth has been on a campaign to disrupt the images we see with satellite surveillance by implanting her large scale paintings into urban areas so that these space voyeurs will automatically add them to their large database. Dilworth’s Paintings for Satellites (pictured at top) consist of extremely large paintings on New York City rooftops (including one in Times Square) that can only be seen clearly by orbiting satellites moving through space. 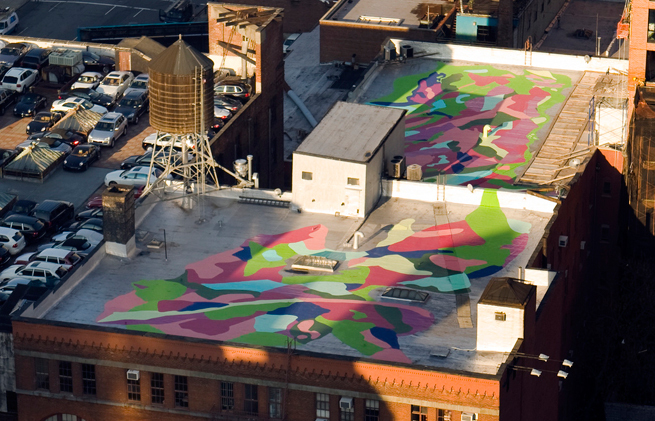 Dilworth describes her images as "physical paintings for digital space" and creates them on rooftops that she identifies as "clearly not designed for the bird’s-eye view" since they contain watertowers, ventilation ducts, air-conditioning units, and more industrial artifacts that are meant to be put out of sight and out of mind. Three paintings have been executed in New York City, where rooftops offer a unique artistic possibility, as bland and unconsidered visual space in an otherwise highly aestheticized urban environment. 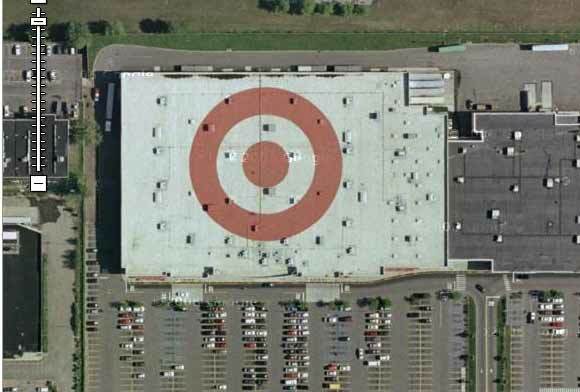 This possibility has not escaped the notice of advertisers, as well, as was apparent when the Target store painted its circular brand on the roof of its building so that viewers using Google Maps would identify its store online. Target Store Ad for Google Maps, 2007. Dilworth's project points to ways in which the design of our built environment has not yet caught up to the way it is depicted in digital imagery, and suggests possibilities for how it might evolve in the future. While locative media is a broad and diverse field of practice, the most compelling projects share the goal of calling into question the very existence of the technology and social frameworks that underpin location-based technological systems. They do so by opening up normally closed, proprietary locative systems (Ronnenberg and Song), by critiquing visualizations of location-based data (Oliver and House), by reflecting on how archives such as Google Maps and Street View condition our understanding of the world (the makers of iSkyTV and Rickard), by intervening in the act of location-aware photography (Pohflepp and Selby), and by pointing to the changes that digital technologies effect on the physical world (Dilworth). As a whole, these projects call into question the effects of these technologies and who they are trying to serve. The more we use these tools against themselves and in creative, unexpected ways, the more we can discover about our increasingly networked world, now and in the future. Galloway, Anne; Ward, Matthew (2005). "Locative Media As Socialising And Spatializing Practice: Learning From Archaeology (DRAFT)”, http:// www.purselipsquarejaw.org/papers/galloway_ward_draft.pdf. Tuters, Marc, Varnelis, Kazys, Beyond Locative Media, http://networkedpublics.org/ locative_media/beyond_locative_media.html. Appleyard, Brian, "Google Street View as Art," Sunday Times, December 11, 2011. 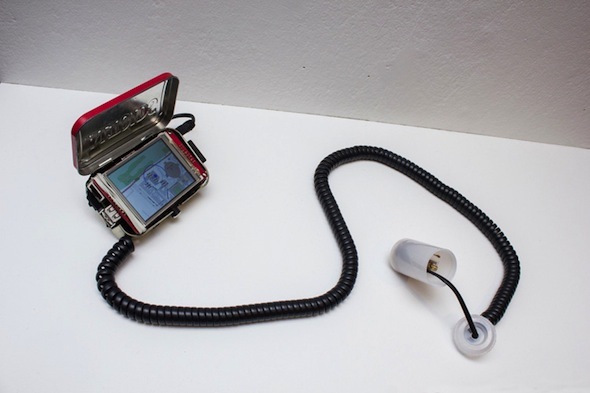 Another addition to this piece is the "Camera Restricta", a GPS and GSM enabled camera by Philipp Schmitt that disables its owner from taking pictures when it finds too many other uploaded pictures that are geotagged from the same location.